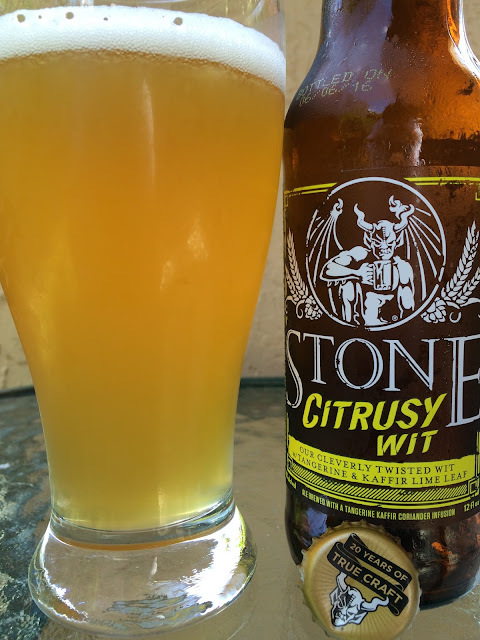 Stone Brewing made a beer called Citrusy Wit. A story on the back label titled "Stone Gives A Wit" lets you know that quality ingredients are an essential part of their beers. 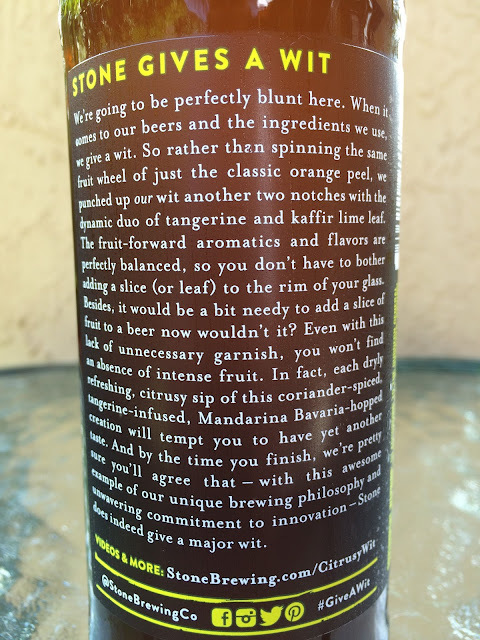 In this case, they ditched the traditional orange peel for tangerines and kaffir lime leaves. The story then goes on to offer several digs at Blue Moon's wedge of orange on the rim of the glass. 5.3% alcohol. Bottled on 06/06/16. With no fruit slice in the way, I was able to really stick my nose in the glass. Terrific fruity tangerine with a wheaty, doughy aroma. Lightly sweet to start. Spicy coriander and a little peppery. Nice body. Oh, yeah, great citrus with some hoppy bitterness. Tangerines, lemons, and a distinct alternate which I'm guessing is the lime. Good idea and nice beer.